Desmond & Beatrice is already selling out of its famous cupcakes before close. Desmond & Beatrice was previously a wholesale and catering operation, supplying cafes such as Green Beanery , Te Aro , Thor Espresso , and others. But a stand-alone cupcake shop was always the dream, says Amanda, the brains and baker behind Desmond & Beatrice. Though the catering and wholesale will still continue. 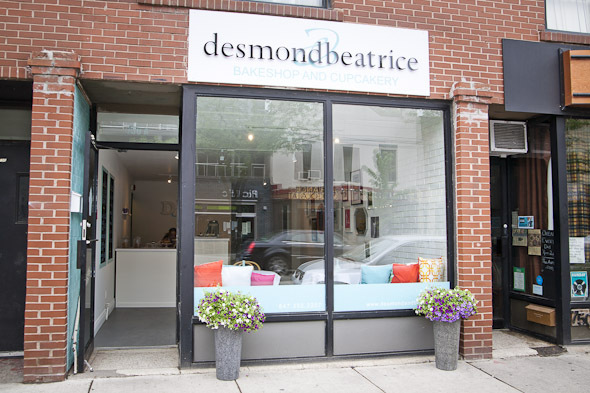 Desmond & Beatrice's shop looks exactly as anyone who has long devoured one of its cupcakes would imagine. It's bright, white, and airy, decorated with framed pictures of paper dolls and cupcake anatomy graphs, and populated with two tableclothed tables sharing a window seat at the front. The focal point, of course, is the counter of fresh cupcakes, made from Amanda's recipe developed through baking with her mother. I drop by Desmond & Beatrice on just its second day, and it already looks like it's on its way to selling out. On opening day, it ran out of cupcakes before close. Sadly, Desmond & Beatrice's famous red velvet cupcakes have already been snatched up, but I still have five to choose from; Very Vanilla, Lemon Heaven, Coconut, Cookies and Cream, and Black and White. I eye the rest of the treats--cookies, squares, and whoopee pies--and Amanda suggests I try the latter ($2.75). The chocolate whoopie pie with vanilla frosting tastes just like a Desmond & Beatrice cupcake but in a different form; the cake is crumbly and moist, the frosting sweet and rich. I nibble at it as I chat with Amanda, who talks animatedly about her baking, tossing in the occasional sharp quip. 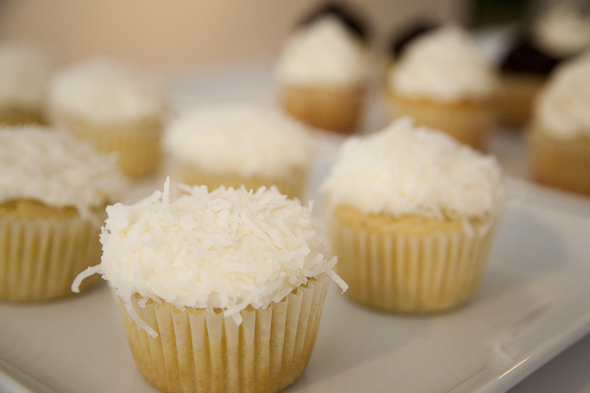 "It's all back to basics," she says, noting that she uses real butter and natural ingredients in her cupcakes. 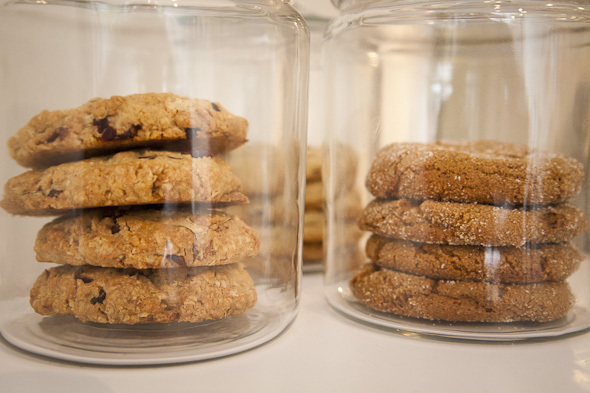 Amanda hopes the new shop will be a place to kick back and enjoy the freshly baked treats. "I want this to be a place where you can just come, hang out, and have a cupcake." 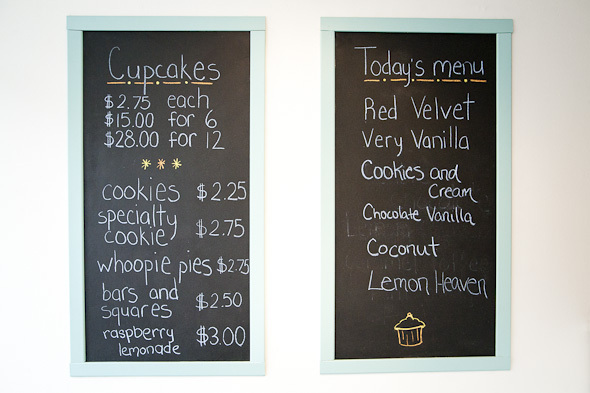 The cupcake flavours will be switched up each day, and Amanda hopes to bring in coffee from Te Aro sometime soon. In the meantime, I select a Cookies and Cream cupcake ($2.75), which is just as good as I remember from sampling Desmond & Beatrice at other Toronto shops. 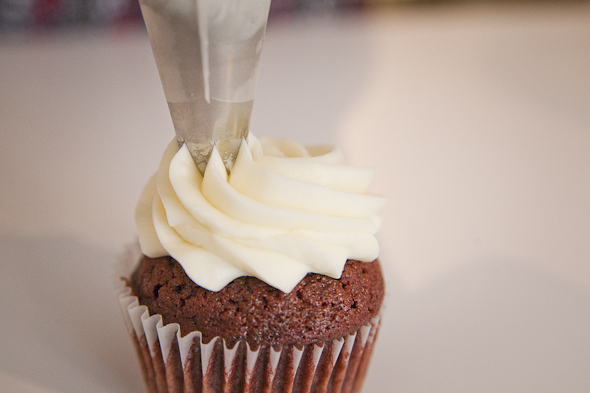 The cupcake has a little substance to it, with a moist, rich chocolate cake and buttercream cookies and cream icing. As I leave I make a mental note: next time, come early to ensure Red Velvet.